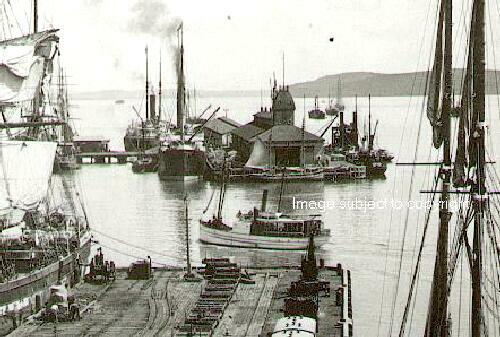 View along Railway Wharf in Auckland, with KAPUI passing the end. 1902 built for Coastal S.S. Co., Auckland. 1905 Coastal S.S. Company became Settlers S.S. Company Ltd.
1915 sold to E.J. Jones of Whangarei. 1919 sold to Northern Fishing Company of Whangarei. 1920 sold to Frank B. Lett, Waitara. 1926 sold to Arthur B. Ogle, Waitara. 1928 sold to Taranaki Shipping Company Limited. 1931 steam engine replaced by oil engine. 1934 August 21st, wrecked Mokau River Bar, West Coast, North Island.